Pirates are the least of Captain Bullseye's problems. He has his cargo riskily stowed away high up in the yardarms so that no peg-leg can get too close to it. But given this unusual way of safe- guarding the cargo, many a hardened sea dog turns out to be just an ordinary seaman who gets into trouble with his balance already halfway up the mast. A. Bend the two waves and put them in the box bottom at an angle. B. 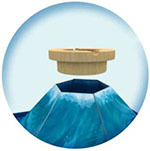 Stick the wooden ring on the hole that has been created "on the waves". 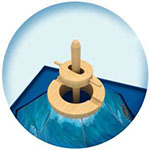 C. Place the joint of the ball-bar on the wooden ring in such a way that the ball sinks into the hole and the two retaining rods come to lie in the troughs of the ring. D. Put the hull on top of the ball-bar. E. Put the ship's mast into the hull (from above). F. Put a small round bar through the bottommost hole of the ship's mast. G. Lay the lower yardarm (showing the numbers 5 and 6) on this little round bar. H. Repeat steps F. and G. for the middle yardarm and then for the upper yardarm (9/10). 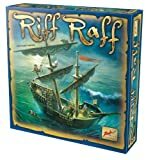 Place the ship in the middle of the table - and off you go! 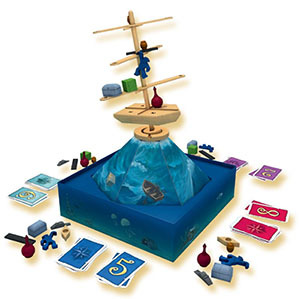 8 different wooden items (boat, barrel, flacon, box, sailor, plank, rat, chest) and put them down in front of you, easily visible to everybody. 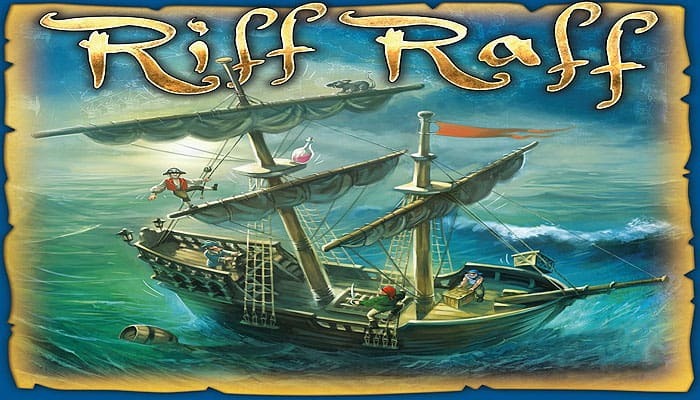 In a two-player game, each player gets twice as many wooden pieces (2x boat, 2x barrel, etc).. The first player to bring on board all (eight) cargo items wins. The oldest player becomes the captain before the first round begins. At the beginning of each round, each player selects one of his own cards and lays it down on the table face down in front of him. Then all players reveal their cards at the same time. The player who has played the highest card immediately becomes the new captain. If several players have played the highest number, the current captain decides which player becomes the new captain. The new captain begins the round with his turn. The person who played the second highest number, takes his turn next, and so on. If several players have played the same number, the captain decides in which order these players take their turns. The round ends after each player has taken his turn. The cards played remain in place and may not be taken back into the hand anymore; that means each card is available to each player only once during the entire game. 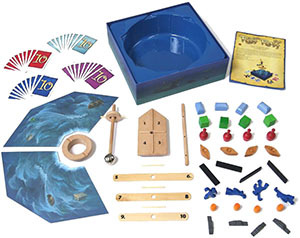 On your turn, you choose one of your wooden pieces and put it on the ship. The number on the card played specifies in which area of the ship you must place this piece. If this is an area on a yardarm (areas 5 to 10) and there is at least one wooden piece already lying in this area prior to the game turn, you may now load two pieces there, one after another. 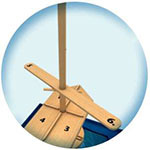 Before carrying out your turn, you have to announce whether you will load one or two pieces. You may not change this decision anymore during your turn. Each chosen wooden piece may be laid or hung on the ship with either one hand or both hands. Cargo may protrude beyond the ship's edge but not into other ship areas. 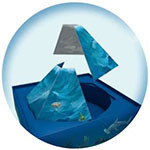 In the process of loading, wooden pieces already lying in place may not be (physically) touched by the player but can be shoved with the help of the wooden piece just loaded. If cargo falls off the ship, your turn ends immediately. However, you should try to catch any falling pieces: All pieces that you catch (with one or both hands) are removed from the game. All pieces that fall down without your catching them, you have to lay down in front of you, clearly visible to everyone, and load on the ship again during the further course of the game. After all players have carried out their game turns one after another, a new round begins. Each player plays one of his remaining hand cards and lays it on his already played card(s) in such a way that only the last one played is visible. The captain of the previous round remains in charge until all cards of the new round have been revealed. Now the player who has played the highest card becomes captain. If this applies to several players, the captain of the previous round decides which of the players involved in the tie becomes the new captain. 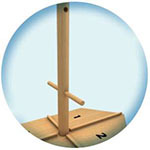 If a player has no wooden piece left at the end of his turn, the game ends and he is the winner. (The current round is not completed). The game ends as well if nobody succeeds in this after having used all playing cards (10 rounds). The player who has the fewest number of wooden pieces left wins; this can also be several players. In the two-player game, after having played all cards, players take their cards back into their hands and continue playing. If none of the players succeeds in getting rid of all his wooden pieces even after the second round of playing all cards, the game ends.